This winner of the Sundance World Documentary prize, made by Ra'anan Alexandrowicz, produced by Liran Atzmor, offers an insider’s view of the logic, structure and moral cost of Israel’s parallel military legal system governing Palestinians under occupation by means of the Israeli army or Israeli Defense Forces (IDF). Interviews with the men who create and uphold these laws, artfully juxtaposed with archival footage, call into question concepts of justice as held in the State of Israel. How long can you live with a double standard? The filmmaker, Ra'anan Alexandrowicz, explains that people originally said his subject was important but too dry; that he should write a book; or, they'd suggest, nowadays doesn't one create a website? He answered that the reason is eyes -- which a film uniquely affects. He quotes Arondati Roy's saying, "Things once seen cannot be unseen." He also explains that he knows he was right to make a film from faces he sees at Q&A's after his film is shown. He sees "a certain and very specific look in their eyes – a look that seems to say to me, “I wish I hadn’t seen your film. I wish I never came.” This in a sense is what making documentary films is all about. Alexandrowicz says his material is "theoretically there for people to see," but "completely hidden from society's eye." The material in this film might be called, reversing Rumsfeld's famous hairsplitting, an example of the unknown known. Israelis are often blissfully unaware of what goes on in the West Bank and Gaza and judges ignored or disregarded the injustices of which they were a part. The "occupied territories" -- the Palestinian lands seized by Israel during the 1967 war and never returned -- were put under "temporary" military control, so all civilian crimes committed there are tried by military court. Residents in the territories remain non-citizens, and so this "temporary" system, after 45 years, maintains their Kafkaesque state of servitude. 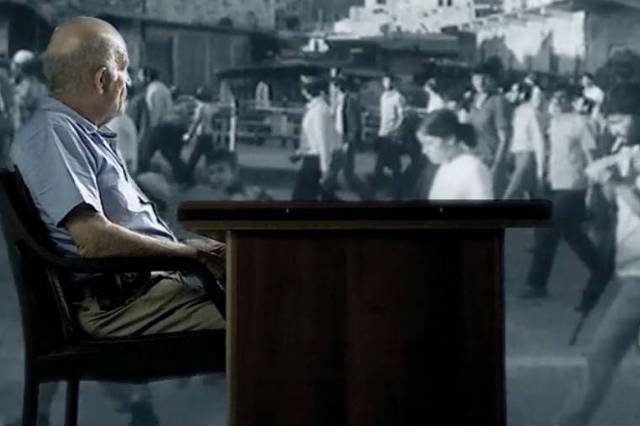 In the story this film tells, one Israeli Justice, Meir Shamgar emerges as key. He is a retired Brigadier General who devised legal cover to in order to confiscate Palestinian land and turn it into Israeli settlements. After doing this, he afterwards presided on the Israeli Supreme Court, thus controlling the only point of ultimate appeal for Palestinians against what his setup allowed to be done to them. Also important is Zair Ramati, a judge who, with the ingenuity of a Talmudic scholar, suggested to Ariel Sharon the Ottoman Empire law of "dead lands" as a way of getting around an Israeli Supreme Court ruling against a Jewish settlement. Alexandrowicz found that in the case of the Israeli settlers, neither military nor civilian law was enforced when it came to aggressions and attacks on Arab property, even in cases of manslaughter or murder. If ultimately the Supreme Court ruled against the Palestinians every time, what value has law or justice in Israel, for the occupied? None; but the Supreme Court's abiilty to hear petitions from Arabs has helped legitimize the occupation in the eyes of the Jewish popularion. But what meaning does the word "democracy" have as applied to the country that has the legal disparities? The most candid of the judges questioned former military judge Jonathan Livny says, in a climactic moment of the film, "You serve a system." Livny adds: "It's an unusual situation. As long as it's temporary, fine. But when it goes on for 40 years? How can the system function? How can it be just?" The art of Alesandrowicz's film is the way it juxtaposes its carefully collected testimony with other images such as Israeli destruction of Palestinian houses. He poses his legal witnesses on a high dais as if in a courtroom with a large green screen behind them on which he projects such images as they speak. They sometimes turn around to look at them. This creates a theatrical and sometimes ironic effect. The filmmakers are shown assembling their set to start off, furthering the Brechtian effect. Alexandrowicz continually acts as Devil's advocate in questioning the retired judges. But he must be polite. He must keep them from walking out. On the film's Facebook site, an Arab contributor, Dunya 'Alwan, quotes the film's tagline, "Can a modern democracy impose a prolonged military occupation on another people while retaining its core democratic values?'" and comments, "Is this a joke? I hope so!" And this is the fundamental issue, starker than any of the various morally dubious events that have occurred in US history due to the length of time and the smallness of the country and the centrality of its fundamental conflict with the region's other occupants. But how strongly does Alexandrowicz pose this issue? He is speaking as one who is still asking that question that Dunya 'Alwan regards as ludicrous. This is his limitation. Another trouble with the film, which Alexandrowicz freely acknowledges from time to time as part of his Brechtian approach, is that, while the overextended Israeli occupation's illegal legal system (which contains various laws and practices contrary to international law) is certainly manipulative, so are the cinematic methods in The Law in These Parts. But if he is manipulative he is also meticulous in the research behind the questioning and the questioning itself, and that makes this an informative film. It is a little bit too self-conscious at times, but given the seriousness of the subject, that is understandable. One leaves it more aware of the limitations of "justice" and the courts. Despite its acknowledged faults, this is a brilliant and moving piece of work. Vimeo excerpt from the film.